In the early days of electronics, it was common for items like televisions and radios to be used in the home for a decade or more. If and when they eventually failed to operate properly, they were often repaired and used for many years afterward. 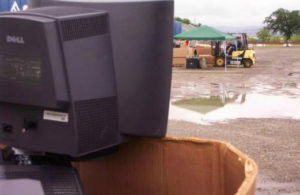 Items that fall into the category of e-waste include computers, monitors, televisions, pagers, cell phones, stereos, printers, keyboards, mice, speakers, radios, projection equipment, palm pilots, MP3 players, scanners, fax machines, video game consoles, video games, telephones, CD players, VCRs, internet devices, and other similar products.